First and foremost, I have to say… I’ve become addicted to exercise! I love it, I love it, I LOVE IT!! I’m getting stronger and stronger. I have noticed that I have more energy to do things around the house. I can feel the absence of the weight that I’ve lost. It’s just a GREAT feeling of health! This is ALL worth it! 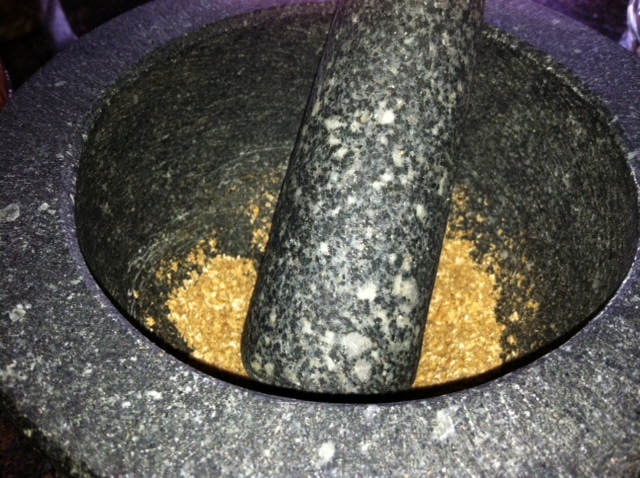 I noticed that I did not have ground coriander, but rather coriander seed. So, I came to the conclusion that I would have to do this the hard way. I took out our HUGE mortar and pestal and began grinding away. Oh my goodness the scent that these seeds gave off was just delightful! It had a strong lemony smell, very pleasant. 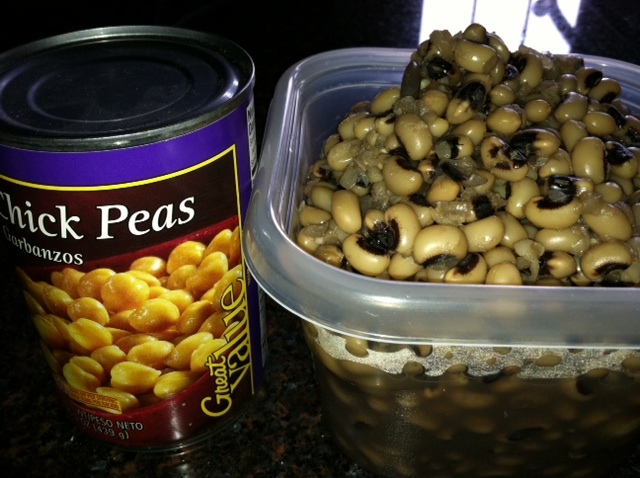 Earlier, I had soaked and cooked some black-eyed peas. I took them out of the pot so they could be measured for the recipe. Then, I grabbed a can of chick peas. 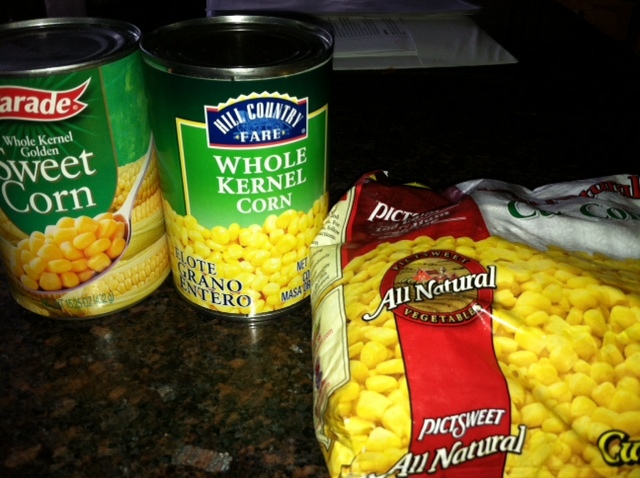 When I grabbed the chick peas, I also grabbed the canned corn. I was GREATLY distressed as I read the ingredients… SUGAR. So I grabbed another can of corn. Much to my dismay, the ingredients listed included SUGAR as well. I was just about to run to the store AGAIN when I thought of the bag of freezer corn we had. 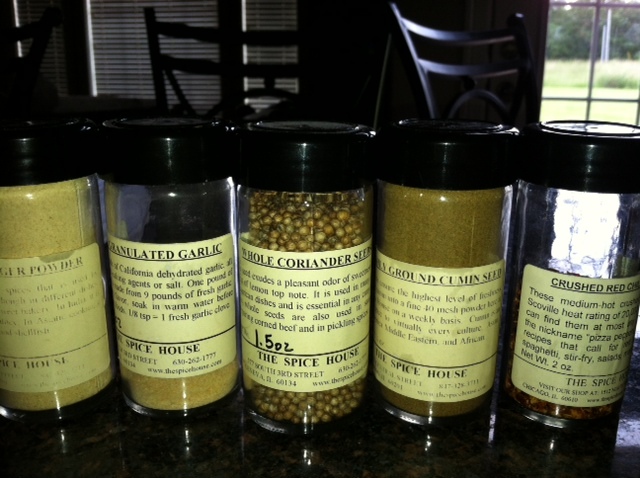 Reading through the ingredients provided a lot of relief…. NO ADDED SUGAR OR SALT! Just beware of the sugar content in canned corn please. 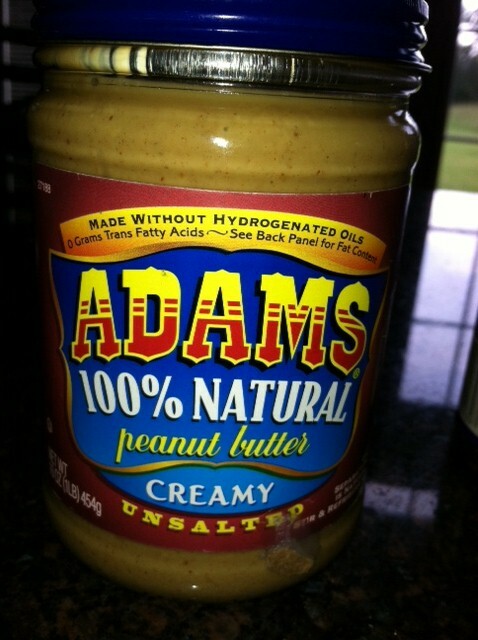 Finally I took out our organic peanut butter (we have some JIF brand peanut butter for the boys). It is unsalted and all natural. Perfect! One more thing… my pride and joy! The recipe called for 24 ounces of canned tomatoes. 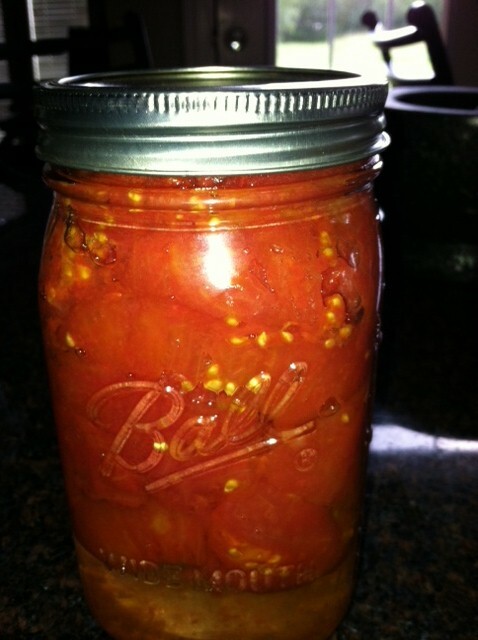 I was glad to use the bottled tomatoes that Steve and I put up from our bounteous tomato harvest earlier this summer. I actually included the whole jar. I drained the tomatoes well, then chopped them up and threw them in the pot when the recipe called for it. Dinner tonight was fabulous! I soaked some black bean this morning. This afternoon I rinsed them, covered them with new water, and put in one chopped onion, and one chopped garlic clove. After the water started boiling, I added about 1 tsp. ground cumin. They had to cook on medium heat for about 1 1/2 hours. DELICIOUS! For the rice, I chopped 1/2 onion, 1 large jalapeno, and a good size handful of fresh cilantro. I made sure these were chopped up nicely. Then I measured one cup of vegetable broth, and 1 1/2 cups of water. I put in one cup of brown rice. I cooked it like normal rice. I brought it to boil, then placed a lid on it and turned down the heat to low. I let it simmer for about 45 minutes. Just divine! 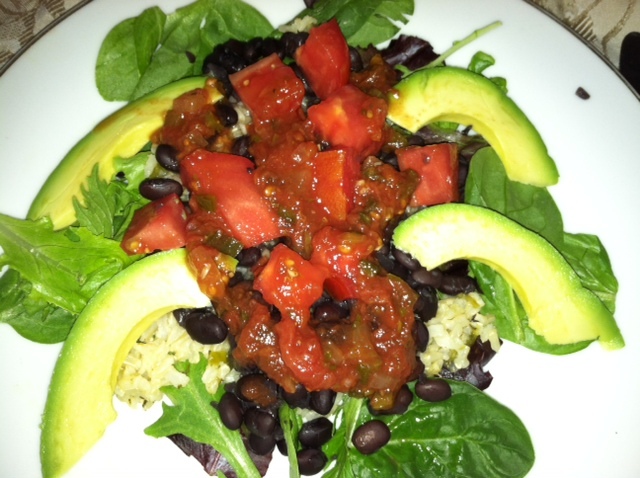 We put the rice and beans over a bed of lettuce, then put tomatoes and avocados on top. We garnished it with salsa and some cilantro/lime vinegrette fat free dressing. SOOOOOO GOOD!! This is one of my all-time favorite summer treats. The problem is, they can be kind of pricey. Today I was shopping at Sam’s for my weekly produce when I spotted these. I admired them and drooled over them a bit before I noticed the price! It had dropped one dollar since last week. I decided to indulge and so I grabbed them quickly before I changed my mind. 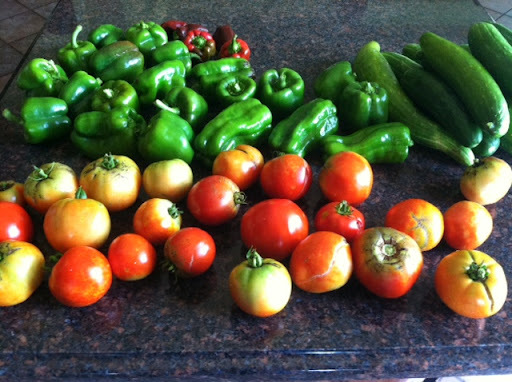 Today, they were only $3.99 a pound. 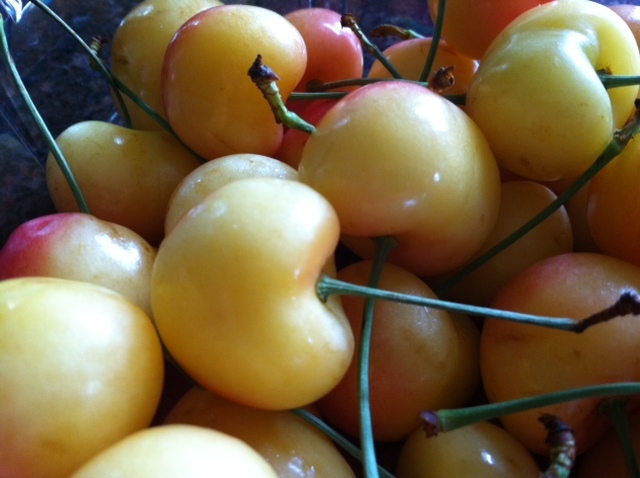 The skin of this fruit is much more delicate than the regular Bing cherry (which I love as well) and the flavor of the flesh is milder, more mellow, and just divine. I couldn’t help myself but to eat a few on my ride home from Beaumont. If you haven’t tried these yet this summer, you might want to. I think you will be pleased. Rinse beans. Add 3-4 cups water and soak overnight. 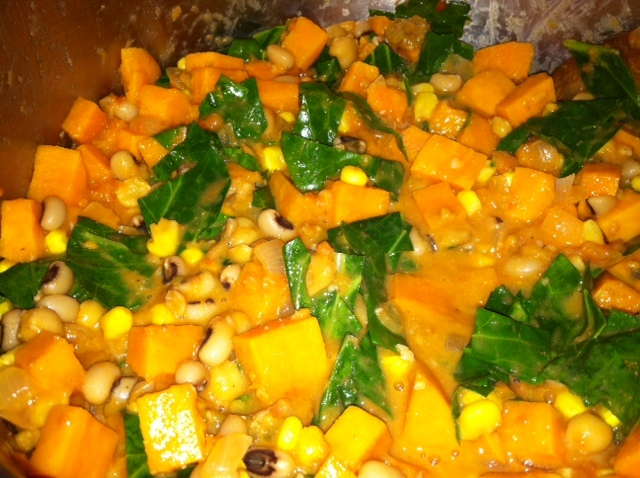 Drain beans, cover with water and simmer until tender (30-40 minutes). 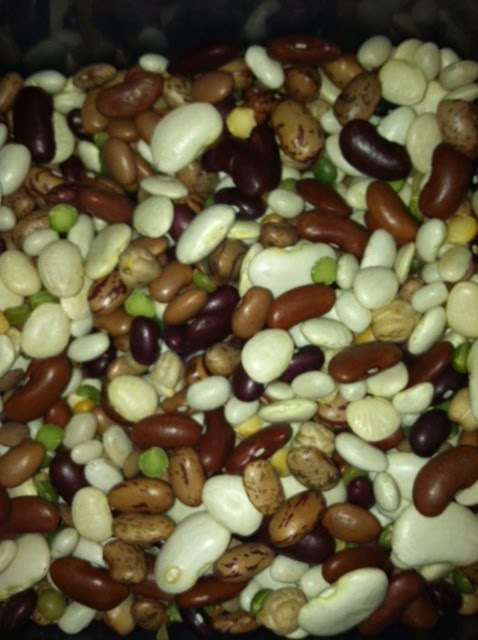 Drain beans, set aside. Bring 2 1/2 cups water to boil. Add 1 cup rice. Cover and simmer for 45 minutes (or until all liquid is absorbed). Put 3 tablespoons vegetable broth in frying pan and add the minced garlic. Sauté for 3 minutes, stirring so the garlic doesn’t burn. Add onion, celery, and carrots (and additional vegetable broth if needed for moisture) and sauté for an additional 5-7 minutes. Remove from heat and mix with the rice. Add the seasonings (all the dried seasonings, pepper, and fresh parsley). Mix well. Mix in the beans. 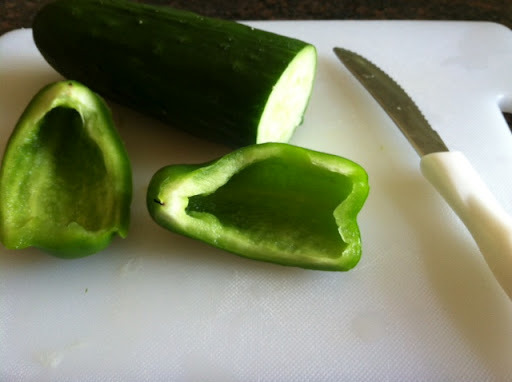 Cut the tops off the green peppers and remove the seeds. 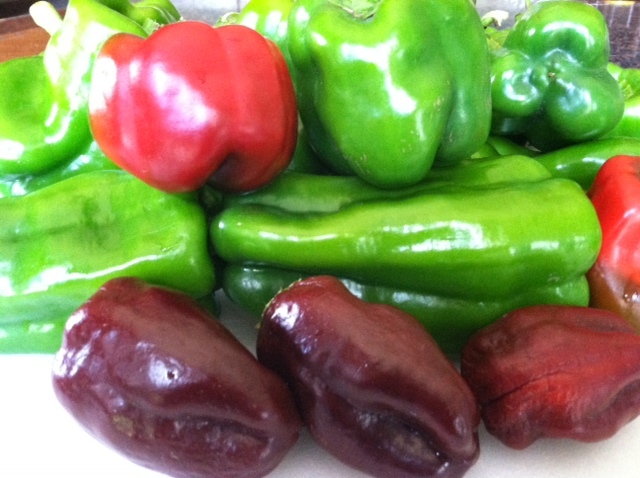 Stand the peppers in shallow baking dish. 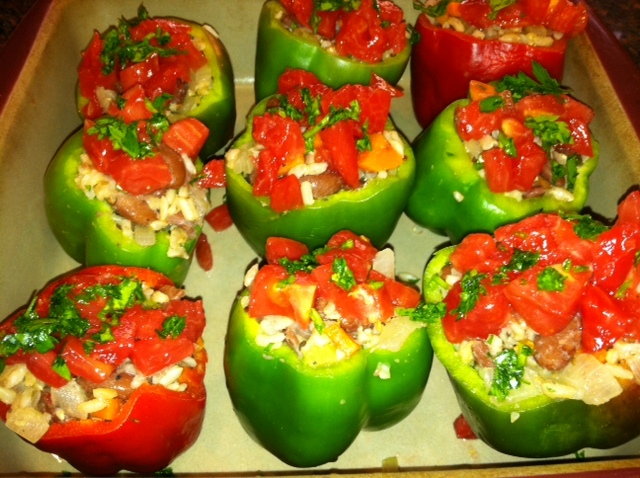 Fill peppers with bean and rice mixture. Dice tomato. 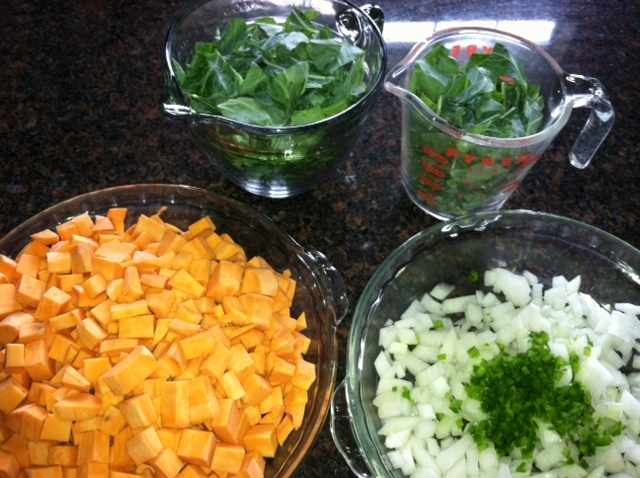 Place the diced tomatoes over top of each pepper and top off each with a sprinkle of fresh parsley. …apparently nobody in the 1940s knew about KALE CHIPS. Apparently since the war, there have been botanical improvements to the vegetable, therefore making it taste better. Seriously, this stuff tastes better than popcorn. I like to eat it on the couch with my husband while we watch movies on weekends. We hardly ever leave leftovers. Heck, if I’m alone, I’ll eat the whole head by myself! Using a colander, rinse off kale leaves while tearing away from stems into bite-sized pieces. 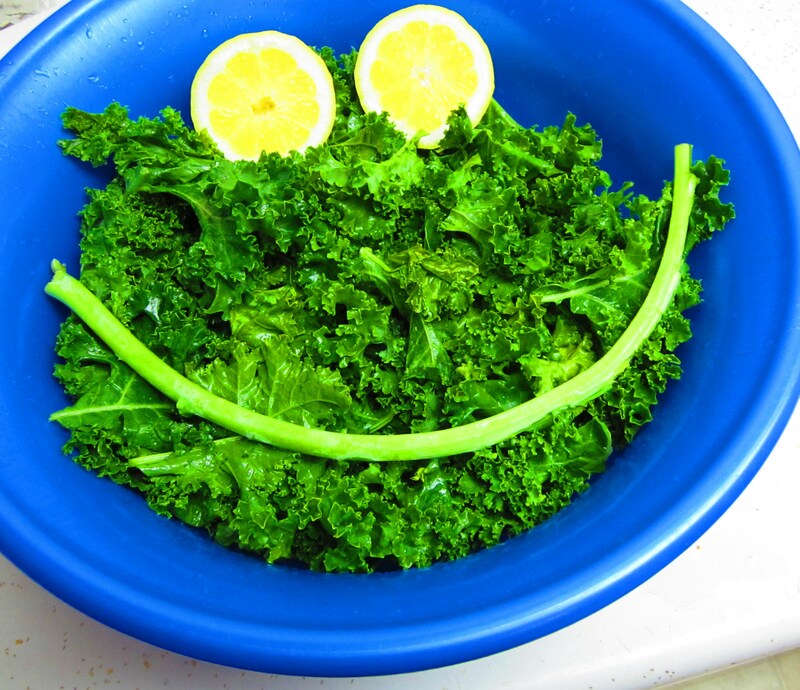 Combine kale, olive oil, salt, and lemon juice into a large mixing bowl. Mix well. 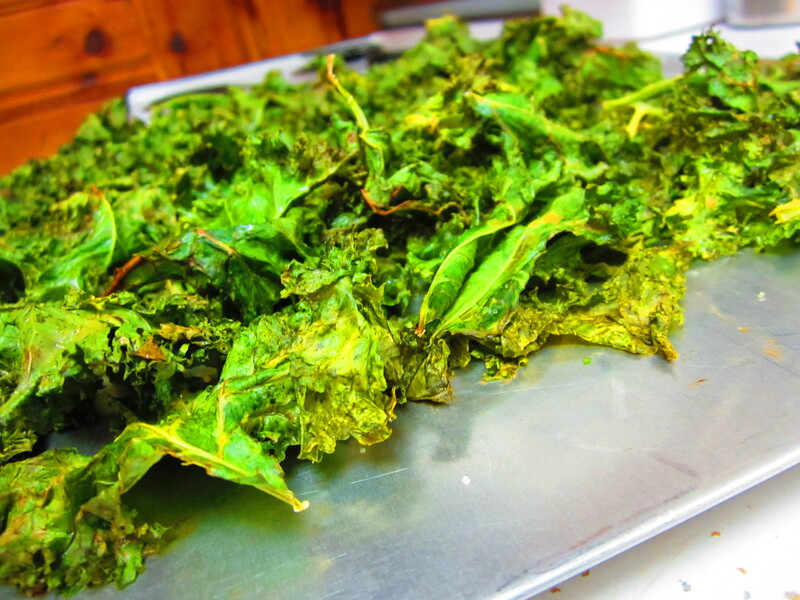 Add seasoned kale to a baking sheet and bake for 15 minutes, stirring halfway through. Poulter, Sean (2007). World War Two vegetable comes back as ‘superfood’. Daily Mail 3. (On-line). Retrieved from: http://www.dailymail.co.uk/news/article-485506/World-War-Two-vegetable-comes-superfood.html. Oh my goodness! 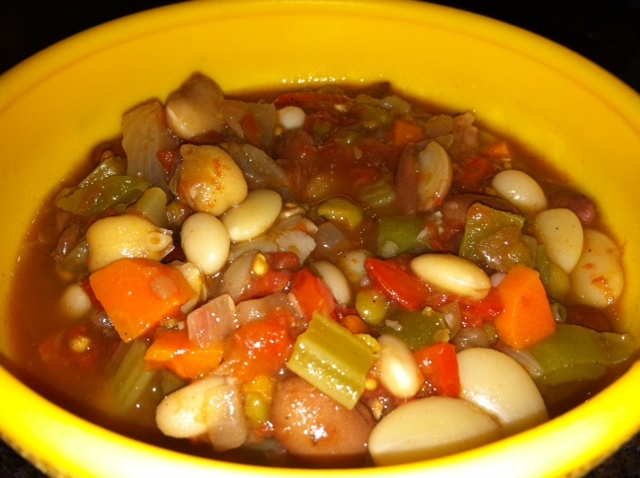 I just made THE.BEST.BEAN.SOUP.EVER!!! And I’m so proud of myself, I made it all up. I could not wait to blog about this, even though it’s late and past my bedtime! Soak the beans in water overnight. Drain and rinse. 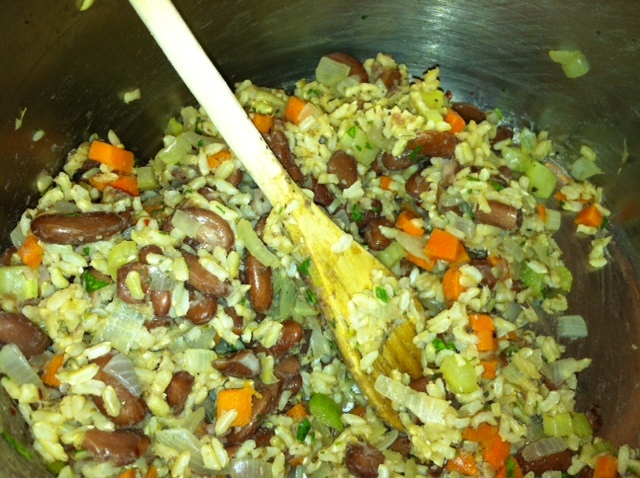 Place the beans and vegetable stock in large pot. Bring to a boil. Add chopped veggies, garlic, tomatoes and spices. Simmer on low for about 1 1/2 hours. This would be great paired with some brown rice! Due to the high level of stress associated with being a college student, I hereby pronounce myself a sniffling mucus monster. Being sick in the summer is the worst. 1. Nobody else is sick. 2. It’s so beautiful outside. 3. It’s hot, so snuggling up in a blanket has the effect of making things feel sticky and gruesome. The good news is that the best remedy for this sickness is inexpensive and tasty. Some side benefits: Carrots have been known to be “good for the eyes” due to their high content of hydrocarbon carotenoids. (Arscott and Tanumihardjo, 2010, p. 223). Nice to know that wasn’t just a wives tale. 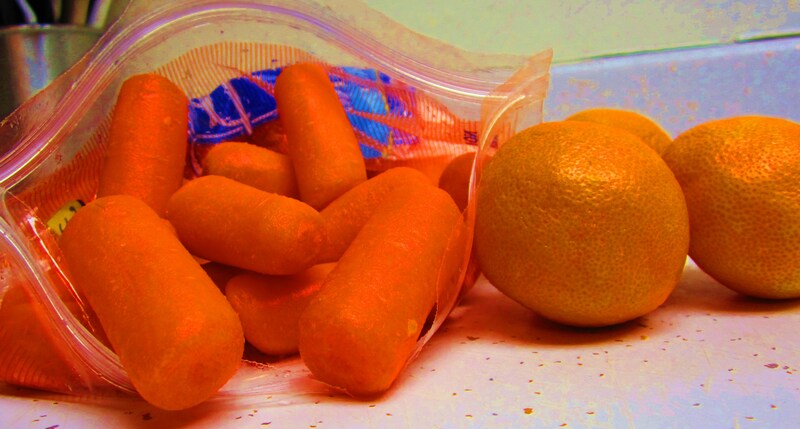 Apparently, the color of carrots used to be primarily purple and yellow! Next time you’re on a trivia game show, you can thank me. “Increased levels of stress suppress the body’s immune function, and during these times many people tend to cuddle up with comfort food. For this reason, it is especially important to feed stress-related cravings with healthy foods that help build the immune system.” (sunkist.com) When I read this, a thought crossed my mind. How often do we just “throw in the towel” when we get sick, thinking that no matter what we eat or do, our sickness is going to run its course? I know I’m just as guilty as anybody, and I feel that it’s time for a change. So next time you’re feeling the sniffles, remember to stock up on the color orange to help boost your immune system. Treat yourself to some yummy oranges, grapefruit, nectarines, mangoes, peaches, and carrots. 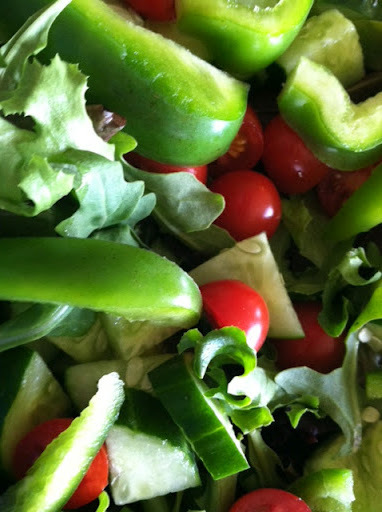 The flavors are extremely satisfying, and the results are healthy! Your body will thank you. Arscott, Sara A. and Tanumihardjo, Sherry A. (2010). Carrots of Many Colors Provide Basic Nutrition and Bioavailable Phytochemicals Acting as a Functional Food. Comprehensive Reviews in Food Science and in Food Safety, 9, 223-239. You can just see the water oozing out of these. They were SO CRISP and FRESH! Delicious. I made a delicious salad.